Within half an hour of landing at Yerevan airport I was ensconced in the urban chic of The Club, a restaurant, bar and tea room at 40 Tumanyan St, central Yerevan. It is one of those cool basements with tiny signs that you have to know about to find. Luckily for me a local knew about it and I was pleased to get my first taste of Armenian food. 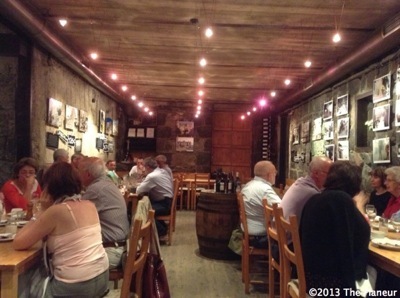 The chef here is Anahit Sargisian who specialises in the menus of Western Armenian, serving them with a French touch. 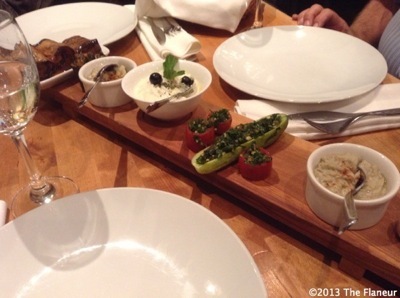 We started with a Seven Colour Palette from the Armenian and Mediterranean menu. This is a long, narrow piece of shaped wood on which are balanced seven local delicacies. These included rolled aubergine, hollowed out cucumber, tomatoes and mushrooms all stuffed with herbs. These were paired with a strong humous, yoghurt and of course lavash. Lavash is the famous Armenian flat bread that is served with every meal. Much thinner than other flatbreads or tortilla it is cooked for only a few seconds in ovens set into the ground. 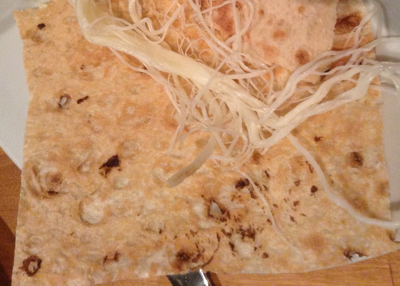 It has more elasticity than other flatbreads and went well with several strong cheeses, including Rope cheese which looks like spaghetti and is very salty. Afterwards we had a tomato soup and then a succulent steak wrapped in pancetta with a thick-cut vegetable salsa and wedges. 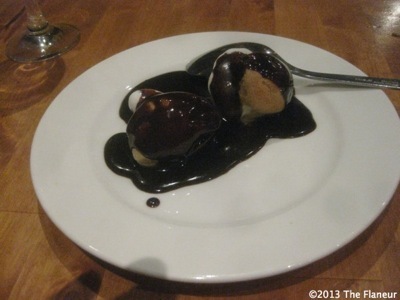 For dessert were profiteroles coated in thick chocolate sauce, an iced filling giving a cooling finish. Our waitress Anna – who spoke great English – recommended finishing the meal with Armenian herbal tea. Served in a chemistry-experiment type flask with tall, narrow cups it looked exotic and tasted unusual, made as it was with mint and thyme, a mixture I have never experienced as tea before.